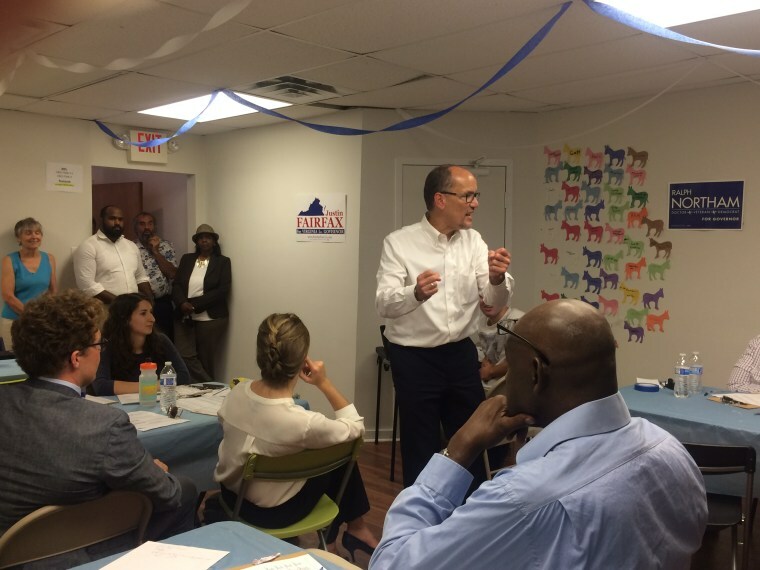 RICHMOND, Va. — Tom Perez arrived early last month at a cramped Democratic campaign field office here, where a large chalkboard on a back wall blared the urgency of his visit: "Countdown to the Vote: 88." That's how many days Perez had to get Democrats riled up for Virginia's state elections. Perez delivered the sort of rousing, preacher-like speech he's known for, getting responses from volunteer phone bankers of "Amen" and "Yes." He spoke of the McCarthy era and how the country beat it back because of its "gyroscope." "Just when you think that gyroscope is spinning out of control, it rights itself," Perez tells the volunteers. "Well, folks, the gyroscope is not a piece of technology ... the gyroscope is the most important word in our democracy, the first word of our Constitution ... We.'" "We" is a word Perez, the DNC's first Latino chairman, has emphasized in his first six months on the job. He spent the summer crisscrossing the country with progressive figures like Sen. Bernie Sanders, I-Vt., trying to mend a party still riven by a contentious 2016 primary and rattled by President Donald Trump. He has put party resources and his energy into 2017 state contests, particularly the Virginia and New Jersey governor's races in November, while trying to capitalize on the anti-Trump sentiment to boost the party's loyalists and donors. But there's still much for Perez to address as he steers the DNC toward the all-important 2018 midterms. The party lags far behind Republicans in fundraising (although individual candidates and progressive groups are raking in cash). Ideological splits, including those between the Sanders and Hillary Clinton wings of the party, continue to puncture the united front. How the party comes together going into 2018 will be a crucial test for Perez and the DNC. Some Hispanic Democrats have expressed enthusiasm about his direction, while other Latinos and members of the party say he has a long way to go to unite the factions into a winning coalition. With Labor Secretary Alex Acosta the only Hispanic in the Trump Cabinet, Perez is one of the few high-profile national Latino leaders. A successful Perez-run Democratic Party not could only raise his standing but also could improve the party's credibility with minority voters. As the first Latino to serve as Democratic National Committee chairman, Perez, who is Dominican American, carries an often-unacknowledged added pressure to perform, one that many minorities who were firsts or who find themselves to be one of the few also experience. "I think there's an unfair burden with people trying to break barriers," said Stella Rouse, a political scientist at the University of Maryland. "We saw it with Barack Obama. His failures were criticized more than his successes [were] lauded. There always will be people who'll say, 'That's what happens when you put a minority in charge.' He has a lot to gain, but he has a lot to lose." Related: Opinion: Latinos Need A Voice. Where Is It? 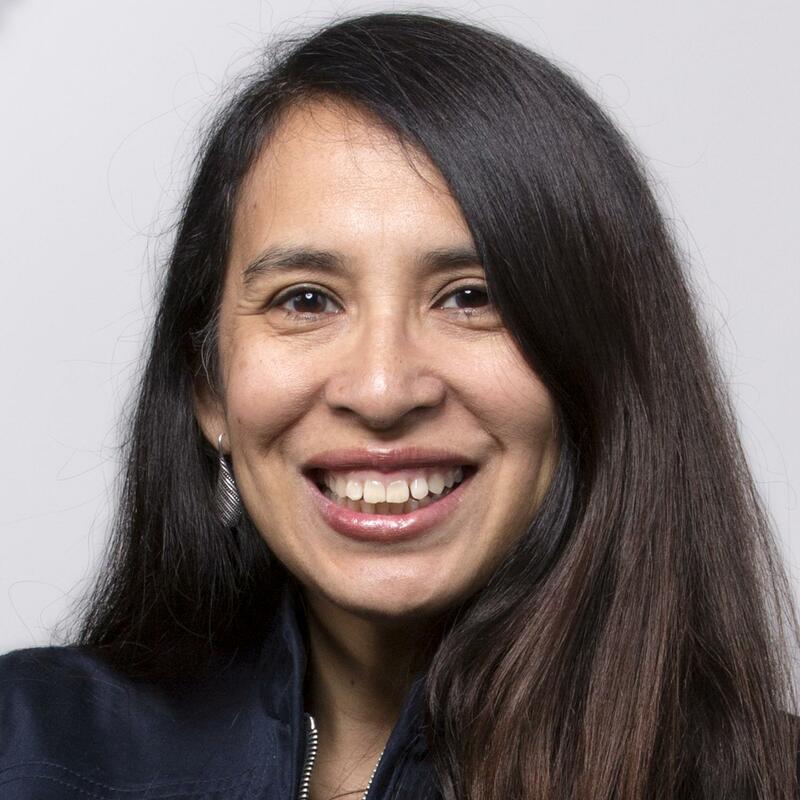 Rouse, director of Maryland's Center for American Politics and Citizenship, conducted research that included a Latino poll in April about leadership in the community. The analysis found strong desire among Hispanics for a national leader but little consensus on whom it should be. Just 4 percent chose Perez. But Perez didn't run a campaign based on being the first Latino to hold the job, Rouse said. Although he doesn't avoid discussing his background and historical role in his campaign, Perez's emphasis is on uniting a party trying to find its identity while electing Democrats. "I wake up every day wanting to improve people's lives. That's why I've been in public service my whole career. That's why I ran for this job," said Perez, who was labor secretary and assistant attorney general in the Obama administration. "When we elect good Democrats up and down the ticket, we improve people's lives." Perez has spent the months since his March election meeting with state party leaders, investing in key 2017 races, meeting with party organizers and former Sanders supporters, raising money and traveling the country for the party's "Resistance Summer" organizing events. In special elections in South Carolina and Georgia, the DNC efforts increased minority outreach, the party said. Perez has participated in canvassing kickoffs in black and brown communities, such as in Rock Hill, S.C.
Perez has put an early investment of $1.5 million of party money into the Virginia governor's race, one of the two gubernatorial races in November. The investment is one of the largest by a Democratic group. In addition, the party has increased its State Party Partnership Program, through which it hopes to give every state party $10,000 a month. That would be a 100 percent increase from 2015 and a 33 percent increase in base funding from 2016, "and that's a floor," Perez said. The DNC is also launching a $10 million competitive innovation grant program for state parties to come up with the best ways to do business "while ensuring the accountability and data-driven programming needed to win elections across the country." Another $500,000 in grants will be available for Democrats Abroad, Washington, D.C., Puerto Rico and other territories. The party has been beefing up states' technical services and voter protection while pledging to build up staff training and voter contact tools. "We have one of the most divisive presidents in American history. Everything he stands for is an affront to American values of inclusion and opportunity for everyone," Perez said about his party. "E pluribus unum ['out of many, one'] is what we've been about." With major Senate and gubernatorial elections in Texas next year, local Democrats want the national party to pay more attention. The Texas complaint has long been that the party treats it like an ATM for political contributions but doesn't put money back to help Democratic candidates, who haven't won a statewide office since 1994. The state hasn't seen any additional money yet, but it's still negotiating with the party. Nonetheless, Gilberto Hinojosa, chairman of the Texas Democratic Party, said he already sees a difference under Perez. "I don't want to say bad things about the prior chairs, but there was very little access to them — they never really tried to seek your input," he said. Hinojosa — whose daughter, Xochitl Hinojosa, is Perez's communications director and worked on his staff in the Obama administration — said some of the change was visible at a recent party meeting in Detroit. Perez gathered the state chairmen in a roundtable setting, filled them in on party operations and election work and made sure DNC staff from those contests spoke to the chairmen through conference calls. Hinojosa said he thinks political performance tests of the sort Perez is under will soon end for Latinos because of the influence of groups such as BOLDPAC, the political fundraising committee of the Congressional Hispanic Caucus, which has hit fundraising records. The Texas Legislature's Democratic Caucus is majority Hispanic. "Without us, there is not a Democratic Party in Texas. Period. This trend will only continue," he said. Can he raise more money? Bolstering state parties while rebuilding the national party infrastructure takes money. As NBC News reported, the Republican National Committee raised $86.5 million so far this year and has $47.1 million in the bank, compared to the DNC's $41.9 million fundraising haul and $6.9 million in the bank, offset by $3.4 million in debt. Democratic candidates, however, are seeing jumps in donations, particularly as Republicans tried to repeal the Affordable Care Act, or Obamacare. "There is pressure on Tom because he is the face of the party right now," said Albert Morales, political director for the polling firm Latino Decisions and a former Hispanic outreach director for the DNC. Former DNC Chairman Terry McAuliffe said Morales "thrived because he loved the job and wasn't shy about asking for money. If he needed $10,00, he'd ask for $25,000. Howard Dean thrived because he was able to unite the Deaniacs and the establishment wing of the party. Tom will prevail because he understands failure is not an option." Hinojosa told NBC News that there were three people in the DNC finance offices when Perez took over and that the party now is working to build it to 30. Spokesman Michael Tyler confirmed that the DNC is hiring fundraising staff, adding that the committee is "confident that our team will raise the resources needed to win elections as we head into 2018 and beyond, unlike the RNC, who will likely need their resources for the Trump campaign's defense as they're being investigated by the FBI." Perez said that more than two-thirds of donors to the DNC are small grassroots donors and that the party raised $5.1 million its first quarter, the most ever from small donors. The average contribution was $22, he said. Perez acknowledged in a telephone news conference last week that "Republicans will always out-raise Democrats." But he pointed out that when Democrats took over the House in 2006, the RNC outspent the DNC by an estimated 2-to-1. The Democrats' advantage, he said, is that the party is more aligned with the values of a majority of Americans: the belief that health care is a right and that comprehensive immigration reform is "the way to go." "But we're always able to get enough money to get our message out, and that's what its all about," Perez said. "We had the best small-dollar fundraising quarter we've ever had in the first quarter of 2017, and we continue to raise money at a steady clip." Can the DNC improve its minority outreach? Lucy Flores, a member of the DNC's Unity commission, which Perez created to bring together Sanders and Clinton backers, said the pressure on Perez as the first Latino DNC chairman should spur him to do more "intentional and aggressive" outreach to communities of color. She said she's not seeing that yet. "I think there's been enough time. There should have at least been more progress made in outreach to more talent of color, political operatives, consultants, community-based or -led organizations," Flores said. "I still don't see significant funding going into any of these organizations, and that's a problem." She agreed that he's "up against a lot of barriers," including competing against other Democratic groups, the Democratic Congressional Campaign Committee and the Democratic Legislative Campaign Committee for contributions. Flores criticized the party's fundraising emails, which she said "claim the sky is falling" or say a candidate is going to win and then an hour later say the candidate has lost. "There's still so much disconnect," Flores said, "from what they are doling and how the entire community of Democrats are feeling toward the institution itself — he's got a very large bridge to gap." Perez said he is finding connections to supporters and critics. He met with a a group of Sanders backers in Seattle this summer and asked them to tell him their top concern. They named police abuse, something Perez had aggressively investigated while as assistant attorney general in charge of the civil rights division in the Obama administration. Perez pursued civil rights investigations and prosecutions against about 20 cities, including New Orleans, Albuquerque, N.M., and Oakland, Calif. Some came before the Black Lives Matter movement formed. He was in charge when the Justice Department investigated and sued former Maricopa County, Arizona, Sheriff Joe Arpaio — whom Trump recently pardoned — for racially profiling Latinos. In Seattle, city officials under threat of a federal civil rights suit agreed to a court-appointed monitor and mandatory reforms for the police department in 2012. That was something Perez shared with the Sanders supporter. "They didn't know I had settled the Seattle case," Perez said. During Perez's visit to the Richmond office, volunteers and staff were punching numbers into their cellphones for gubernatorial candidate Ralph Northam, a pediatric neurologist, and candidates running for state office and the Legislature. Perez said he's personally called to thank 22 candidates for stepping up to run. Perez told those manning the phone banks that this election was like the vote in 2005, when the country had an unpopular president, an unpopular agenda and what he characterized as a far-right party. "You know what happened? We took over the House of Representatives in 2006," Perez said. "But you know what happened that helped springboard us to success? 2005 was the last year the Democrats won both in New Jersey and here in Virginia." Democrats are well positioned to win in New Jersey, given Gov. Chris Christie's unpopularity. But the race is tighter in Virginia, which Clinton won in November. Susan Swecker, chairwoman of the Virginia state party, said she was struck by Perez's fiery speaking skills when she first learned of him at a 2016 state party fundraiser. But she said he faces a tough task bringing the party together. "It's like herding cats," Swecker said. "He has passion. He has a willingness to invest in Virginia. The background he comes from, the touch he has for the common everyday person — people need to give this team a chance," she said. "Or we can sit back and be mad and — here's what we got, Donald Trump in the White House."